Durable coated stock. 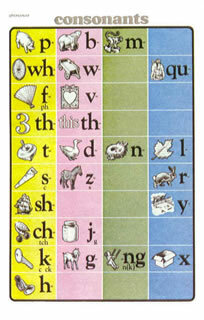 The 26 sounds on the Consonant Chart are organized vertically and horizontally. In the first vertical column are the breath consonant sounds; in the second column are the voiced equivalents of the breath sounds; in the third column are the nasal sounds; in the fourth column are the remaining consonant sounds. This simple organization is enhanced by the all-important muscular order which each vertical column follows.